When I added the extra connection string property setting Locale Identifier=1033 an error was prompted. Instead I had change the Authentication Settings to ‘None’ This did the magic. It is also an intresting way to document your formulas. If column formulas could be retrieved it the same way, it would make live easier. As I said in the post, though, I’ve seen some weird behaviour around the last refresh dates and it doesn’t always seem to be correct. I’ve not had a chance to work out why though. Select * from [Sandbox]. [$MyTable] generates a fully editable table with Powerpivot data which CAN be used as a Powerpivot linked table. 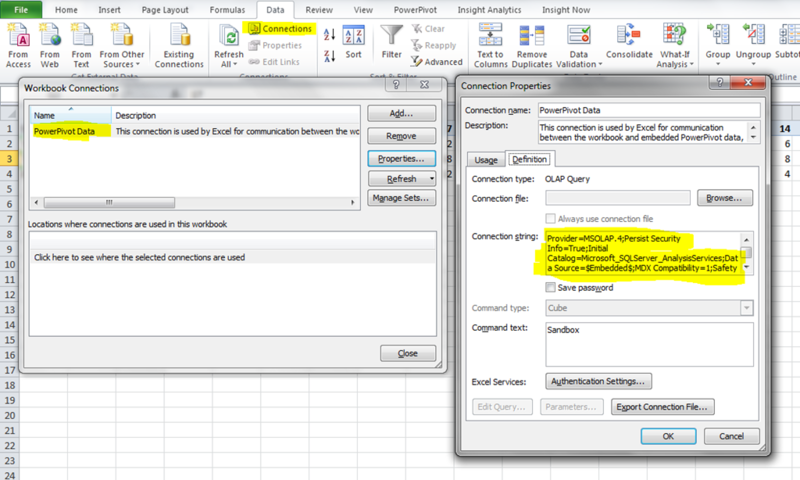 Et voila, Powerpivot writeback without static GetPivotData() stuff. Hmmm pretty cool. Maybe something to write a blog post about? Interesting idea, definitely – thanks! Chris, I am running the following query to get a list of measures and their formulas/expressions from my PP model. I have found that it returns measures that have already been deleted from the model. Are measures and their expressions persistent in the model even after they are deleted? Small optimalization. You can concatenate the object_path in the source query. For unknown reasons, the pretty approach to retrieve DMV content in Excel, the approach no longer works with Excel 2013. Exists there another solution for this version of Excel ? Yes, it’s even easier in Excel 2013. 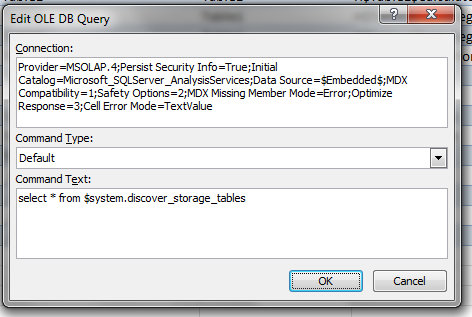 Just create a regular query table against any table in the data model (see http://www.powerpivotblog.nl/implementing-histograms-in-excel-2013-using-dax-query-tables-and-powerpivot) and then you can click “Edit DAX” and enter your DMV query there. Thanks a lot. Just works great!